These Yummy Dahi-Vadas r popular in TamilNadu.U can try this dish with leftover uraddhal vadas too.Otherwise, do the vadas first.Serve these Dahi-vadas at tea-time or with breakfast.Chennai Dahi-vada recipe is given here to try at home. 1/2 cup - Urad dhal - soaked for an hour and ground into a flour without adding water. few coriander and 4 curry leaves-chopped fine. Grind 1/2 cup urad dhal which is soaked for an hour,to a flour without adding water. Take a bowl and add the urad dhal flour,ground spices,chopped onions,chopped coriander leaves,curry leaves and Salt.Mix it well. Shape the dough into round-shaped vadas with a hole in the centre. Heat oil in a non stick frying pan and shallow fry the vadai on both sides,till golden brown. 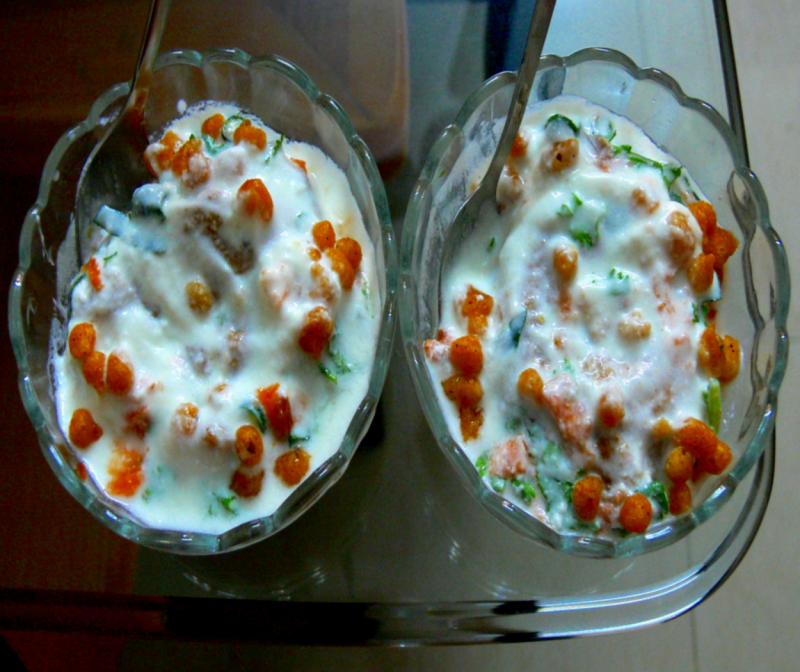 Take another bowl and add curd, chopped green chilli,grated carrot,jeera powder,chopped coriander leaves and curry leaves and salt .Mix well. Soak the Uraddhal vadas(should be fully soaked in dahi-mix) in it and leave them for 40 mins at least(keep them in Fridge).Garnish with kara boondhi on top. Serve them chilled at tea-time or with breakfast. hi, Christy. I m nu on kk n i've bcame a great fan of u n Rabz. This is the same we make in holi with a little variation of using onion in dahi baras.though we make the same for sambar bara.